Justin A. Cohn | The Journal Gazette Komets forward Justin Hodgman, right, takes a faceoff at the Huntington Center against A.J. Jenks of the Toledo Walleye on Friday in Game 1 of the Central Division semifinals. TOLEDO, Ohio – It’s a play that fans of the Komets have seen often this season: A shot was blocked at the offensive blue line, setting up an odd-man rush and a pivotal goal for the opposing team. 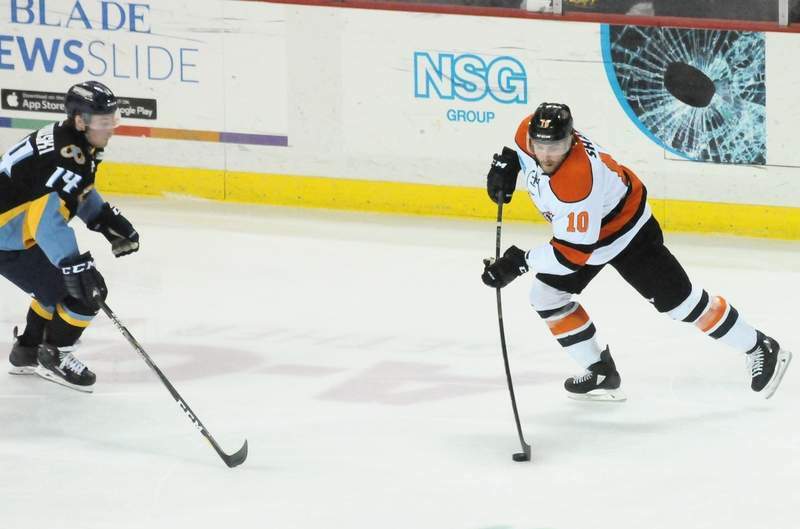 Just as the home fans at the Huntington Center were getting restless, that’s exactly what happened to turn the tide of the opening game of the Central Division semifinals. Shortly after Toledo Walleye goaltender Pat Nagle stopped a Shawn Szydlowski’s attempt from 20 feet to keep the game tied, a shot by Fort Wayne’s Josh Elmes was blocked by Bryan Moore to set off a 3-on-2 rush that saw Moore score a third-period goal for the Walleye. Twenty-three seconds later, Greg Wolfe put a rebound past goalie Zach Fucale for another goal and the Walleye had a two-goal lead. The Komets' Brady Shaw netted a power-play goal from the doorstep 18:34 into the third period, with the goalie pulled for an extra attacker, to cut it to 3-2 and that's how it finished between the rivals. Toledo outshot Fort Wayne 38-30. Game 2 of the best-of-7 series will be 7:30 p.m. Saturday at the Huntington Center, where a crowd of 6,163 was on hand for the opener. The game opened with end-to-end action that included Fort Wayne’s Ryan Lowney saving a goal by diving to swat the puck away from A.J. Jenks, who had gotten his own rebound 2:30 into the first period. A huge check by Toledo’s Ben Storm on Mason Baptista set up Zach Gallant for a shot from 15 feet out that was thwarted by Fucale at 6:05. Anthony Nellis had a great chance to tie it for the Komets at 13:32, when Toledo goaltender was caught sprawled on the ice, but Nellis had a difficult angle for his backhand shot toward an open net and put it into the netminder’s chest. Things between the teams, meeting in the postseason for the fourth time in five years, really heated up late in the first period with Jenks cross-checking Szydlowski to the ice in front of the Toledo net, and Fort Wayne’s Mason Baptista responding by tossing Jenks to the ice as they scrummed in the corner. Szydlowski sparked another fracas when he sent the puck in the net just after the period ended, also drawing a penalty for unsportsmanlike conduct. Again, Nellis squandered an opportunity to tie it, when he broke in alone but was foiled by a Nagle save on a shot right up the middle 8:15 into the second period. The Walleye missed opportunities to score, too, with Register and Ryan Obuchowski both hitting the post late and Tyler Spezia getting bested on a 12-foot shot by a Fucale kick save as he lost his stick. A good dump-and-chase play by the Komets resulted in the tying goal 4:42 into the third period, when a Cody Sol shot from 50 feet out was redirected by Jake Kamrass, who was wearing a full face shield because he was struck by a puck during practice this week. Notes: The referees were Andrew Bruggeman and Jacob Rekucki. … There was a supervisor of officials, former NHL linesman Tim Nowak, who was the first ECHL official to make it to the big league. … Cincinnati’s Jesse Schultz was selected ECHL MVP by coaches, reporters, broadcasters and team staffs. Szydlowski had won it last season. The runner-up was Adam Pleskach of Tulsa. 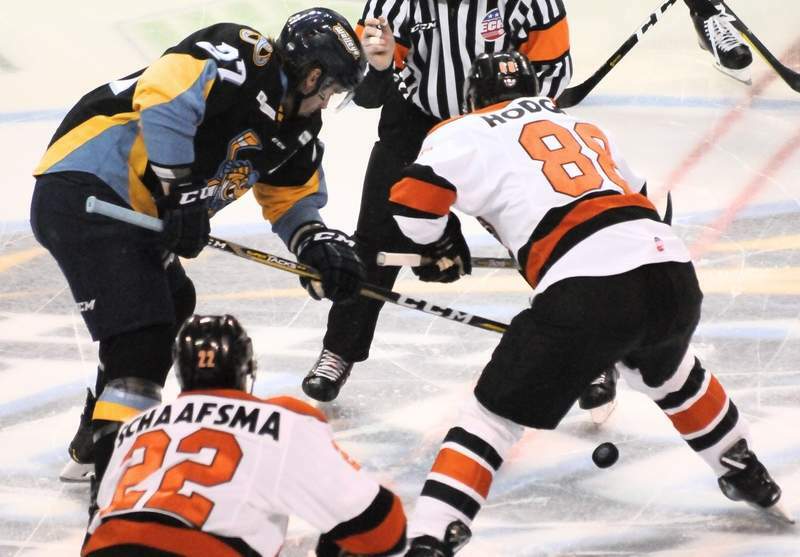 … The Komets played without Craig Cescon, Kyle Hope and Sean Flanagan. Phelix Martineau remained with Laval of the American Hockey League and Matthew Weis was with Chicago. … Toledo played without Marcus Crawford, Jordan Topping, Michael Moffat, Hunter Smith and Trevor Hamilton.